A year after saving a career-high 39 games and earning his second-straight All-Star nod, Perez finished 2013 with a 4.33 ERA, 25 saves and five blown save opportunities. 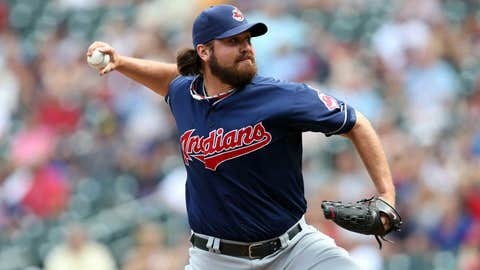 If Chris Perez thought the fans in Cleveland were harsh, he’s in for a rude awakening. The former Indians closer, who had a rocky relationship with the fan base, is heading to L.A. on a one-year deal according to Fox Sports’ Ken Rosenthal. Source: Free-agent reliever Chris Perez, #Dodgers in agreement on one-year deal, pending a physical. Perez is taking his physical today. The fact that the #Dodgers were close to a deal with Chris Perez was first reported by @dylanohernandez. Jon Heyman of CBS Sports revealed the terms of the deal on Monday night. The former All-Star served as the Indians closer for the past three seasons, saving 123 games from 2010 to 2013 but was removed from his ninth-inning duties by manager Terry Francona in September. Perez, who finished the 2012 season with a career-high 39 saves and a second consecutive All-Star nod, had a down year in 2013. He saved 25 games for the Tribe, but had five crucial blown saves and finished the season with a 4.33 ERA. Perez was’t very popular in Cleveland after he openly criticized fans for their lack of attendance in 2012. Things didn’t get much better when he was arrested for possesion of marijuana in June. The Indians released Perez on Oct. 31. He is expected to take on a set-up role in the Dodgers bullpen.